(TibetanReview.net, Jul28, 2016) – China has on Jul 26 described as ‘renovation’ its ongoing destruction and expulsions to halve the residence and student strengths of what is otherwise the world’s largest Buddhist study centre, which is located in Serta (Chinese: Seda) County of Karze (Ganzi or Garze) Prefecture, Sichuan Province. A local government in Garze Prefecture said it was renovating what was one of the world’s largest Buddhist learning centres to prevent fires and to ease crowd levels, reported globaltimes.cn, international mouthpiece of the Communist Party of China Jul, 26. 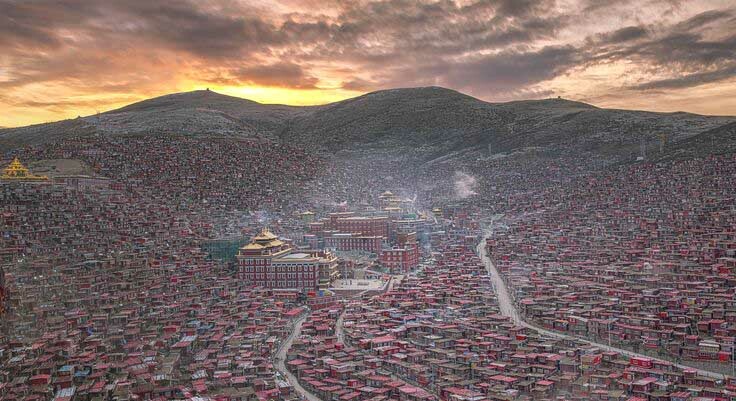 The report cited a senior Garze government official as claiming, speaking on condition of anonymity, that the leader of the Buddhist learning centre, the Larung Gar Buddhist Academy, as saying they wanted to reduce the number of unregistered monks and nuns. It further cited the official as claiming the centre’s leaders themselves had discouraged unregistered monks and nuns from living there. The report cited the unnamed official as saying that a regulation allowed only the more than 8,000 registered nuns and monks to reside in Larung Gar. He has added that foreigners were also allowed to stay there if they underwent the monastery’s registration procedures. Larung Gar has large numbers of students not only from across the Tibetan Plateau but also mainland China as well as countries of South East Asia. The centre’s current abbot has urged people to refrain from protesting against and publicizing the demolitions and expulsions, citing the imperative for the centre to survive, given the authorities’ threats to even close it down altogether. Exile Tibetan and Western rights groups have said the order to carrying out the demolition and expulsions to the tune of 5,000 monks and nuns had come directly from Beijing with President Xi Jinping taking a personal interest in the order’s speedy implementation. The academy, a centre for ecumenical Buddhist learning, was founded in 1980 by the charismatic late abbot Khenpo Jigme Phuntsog with support from the previous Panchen Lama.